Dice green and red peppers. Scrape out cucumber seeds and dice. Peel and finely slice ginger and garlic, Slice green onions and finely chop chili peppers. Cut chicken breast into bite-sized pieces. Mix cornstarch and water in a bowl to make a slurry. Add bite-sized chicken pieces and toss to coat. Add oil to a wok and fry peanuts on low heat for approx. 3 – 4 min. Remove from pan, drain on a layer of paper towels, and set aside. 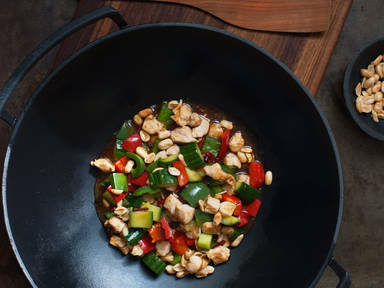 Add chicken to wok and fry for approx. 6 – 7 min., until almost cooked through. Transfer to paper towels and set aside. Make sure to keep the slurry in the bowl. Add sliced green onions, ginger, garlic and dry chili peppers to wok and fry for approx. 2 - 3 min. Transfer chicken back to wok. Add cucumber, diced green and red peppers. Stir in remaining slurry and sauté for approx. 2 min. Mix in vinegar, sugar, Shaoxing wine and soy sauce. Season with salt and pepper and reduce everything for approx. 1 min. Serve with fried peanuts on top. Enjoy!